Pixe Social, developers of award-winning interactive social photo booth technology, releases social engagement results of the 2014 Kronos Incorporated user conference, KronosWorks, in Las Vegas, NV. Hundreds of attendees visited the Pixe Social-powered photo booth during the world’s largest vendor-led workforce management gathering, taking their turn posing in front of dual green screen backdrops and sharing their photos on the Kronos Facebook Page in real-time. 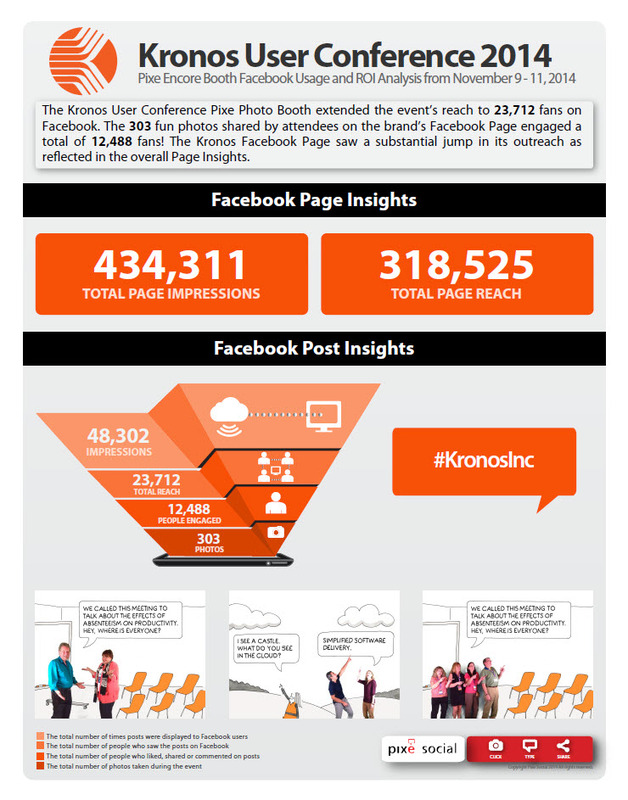 The eye-catching photos captured at KronosWorks 2014 engaged a total of 12,488 people on Facebook between November 9-24, 2014, generating 49,302 unique impressions. At the same time, the photos attracted 318,525 online fans to the Kronos Facebook Page, producing 434,311 impressions. As its largest green screen activation to date, Pixe Social’s capabilities proved to be a popular attraction for attendees by sharing over 300 photos online over the course of the three day conference. Pixe Social invited attendees to choose between two different animated backdrops, shining as an interactive experience in between learning sessions. This added attraction at the conference encouraged attendees to like, share, and retweet their photos for a chance to win an exciting prize. The photo booth users with the most likes on their Facebook photo won a Go Pro Hero 3! Over the past year, Pixe Social has partnered with Kronos at a number of industry conferences and events. This most recent partnership provided a fun and engaging experience for Kronos clients and generated significant viral buzz for the brand. Pixe LLC, a leading technology provider, leverages user-generated content while engaging customers with brands through marketing promotions, delivers enhanced online engagement. Pixe enables businesses to secure 'photomonials' from existing customers to reach out to a phenomenally large base of potential customers on Facebook & Twitter, thus converting audiences into brand ambassadors.